Galwegian u-17s celebrate victory in the Connacht League in Dubarry Park on Sunday. 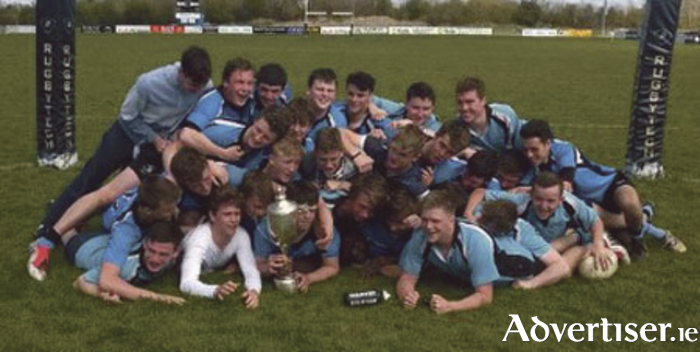 Galwegians claimed another trophy this season when their u-17s overcame Buccaneers by 22-17 at Dubarry Park to win the Connacht League. Both sides were level at the break after Galwegians opened with a Robert Hennessy try, converted by Jonah Culligan on seven minutes. However they were unable to make their dominance count, and the hosts hit back just before the break with a fine solo effort by winger Tommy MaGann, converted by Kyle Higgins. They then went in front with a Higgins’ penalty after the restart. However Wegians regained the lead when substitute Hugh Lane crossed in the corner. Culligan landed the touch line conversion and added a penalty soon after, and when Jasper Byrne scored a third try, the Blues looked to have sealed it with a 22-10 lead with 10 minutes to go. Buccs, however, refused to lie down, storming back with a try from Cory Reed, which Higgins converted, but try as they did, they were unable to breach a determined Wegians defence who held their line to secure a deserved victory and claim this year’s league trophy. Wegians now face Creggs away in the u-17 Cup semi-final.